Dorcus hopei binodulosus is a stag beetle belong to the subspecies of Dorcus hopei, that classified as class: Insecta, order: Coleoptera, family: Lucanidae, genus: Dorcus, ranges 35 to 76mm in length include the large mandibles (under breeding, some of them reach lengths of over 80mm), is the longest in Lucanidae in Japan, yet the largest found in wild is a Dorcus titanus castanicolor. This species are easy to breed and farm, approved for the beginners of breeding stag beetles. 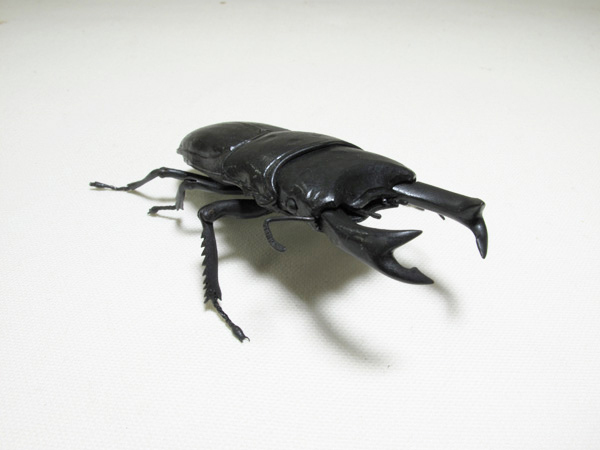 Kuwagata is the common name of stag beetles in Japanese, come from their distinctive mandibles resemble the form of the helmets called also Kuwagata used by samurai in the Warring states period. Though their appearance, they behave cowardly, hide themselves in tree crevices against being approached. Their life involves hibernation, is the difference compared with Rhinoceros beetles, enables them alive longer, could last 5 to 6 years under human controlled environment. This species led the boom of collecting stag beetles, were previously called “Black Diamond” and　highly-valued for sale that was reported by mass media that even the length of 1mm raised the price of thousands yen. However nowadays the collectors attach importance to the beauty in their forms and the width of the mandibles. The stag beetles booms followed after that were Dorcus antaeus and Dorcus hopei from china, were both from abroad yet closed species to them. It has been known that there are crosses between them and Dorcus rectus that are rarely collected, are also be able to be reproduced by artificial incubation, yet the death rate while the larval stage is extremely high, and the population lean to female, usually are the hybrids of male Dorcus hopei binodulosus and female Dorcus rectus, yet also the reverse exist. The size and the form are closed to Dorcus hopei binodulosus, yet have slim body and limbs take after Dorcus rectus, that cause miscapturing of large Dorcus rectus supposed as the hybrids in most cases. Though the development of recent breeding technologies have reduced the price of them into thousands yen at pet shops, the population in wild is descending because of the booms caused overhunts, as the fact they were listed as endangered Species in 2001, yet subsequently the males had the sweet summer surrounded by many females at their habitats of tree crevices. This work has the springs equipped inside of its body, are not only for the movabilities of the limb parts, but also for the distinctive mandible parts.